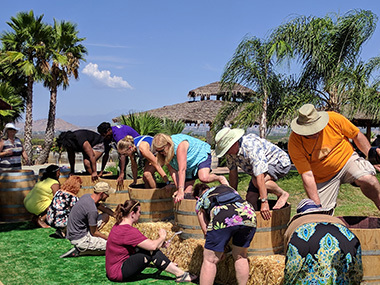 The Temecula wine region began developing in the mid - 1960's when the Kaiser Land Development Company purchased what was known as Vail Ranch in 1964 and began investing in and marketing the Temecula Valley. Horticulturalists were brought in to evaluate the area to learn what type of agricultural products could be grown. Along with avocados, the experts determined that wine vineyards were well suited for the valley. The cool moist air from the coast would settle in the Temecula Appellation in the evening and would burn off the following morning, perfect for grape growing. Vines were planted on our Calle Contento property in 1968 by the first owner. Five acres of the original acres are still producing adjacent to the winery, which was built in 1978. 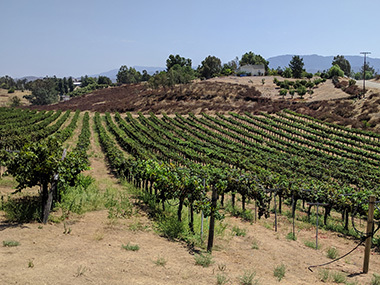 Imre and his wife Gizella Cziraki purchased the former Cilurzo Winery what is now known as Bella Vista Winery, the location of Temecula's first commercial vineyard. The Cziraki's have been updating and modernizing the winery facility and grounds since the purchase. Bella Vista's owner Imre Cziraki began making wine at age 7 with his grandfather in Hungary. He purchased his first vineyard in La Cresta in 1982, which was followed by the purchase of his Bella Vista Vineyard in 1998 and the winery property in 2004. Bella Vista Winery and Vineyard of Temecula uses 80% estate grown grapes and 20% other Temecula grapes to make its wines. The winery has a crush capacity of 280 tons with a production of approximately 19,000 cases of wine per year. The first renovation was to take a large storage room and transform it into our expansive tasting room. Other changes included improvements to our cask room where parties and receptions can be held. Enjoy our picnic area with shady palapas area along a brickwork walkway that circles our duck pond. In the future, facilities will be added to accommodate weddings, parties, and events.